Evidently Abby-Roo didn't want to get out of bed on this particular morning. Alas, the siren call of a freshly refilled hay rack proved impossible to resist. It seems that she found a suitable compromise by reaching out just far enough to gain access to the hay while still managing to keep her rear tucked inside the warm cozy. They can be creative when they put their mind to it! 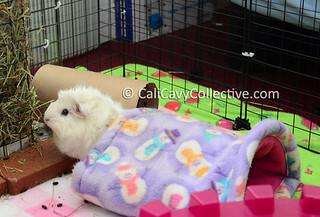 This is what Jaina does - for some reason she LOVES her thatch tunnel, so it's always in the cage. She picks it up on her back like a turtle, waddles over to the food, and proceeds to spend all day eating pellets & hay in the comfort of her own bed :) No wonder she has such a round little rump! Jaina is a funny pig. Abby-Roo would approve of her covert eating/general lazing tactics! Sir Harry is super impressed, he is a particular fan of driving his pigloo over to his food bowl. Abby-Roo is a smart girl!